378. Simonton, D. K. (2010c). Creativity in highly eminent individuals. In J. C. Kaufman & R. J. Sternberg (Eds. ), Cambridge handbook of creativity (pp. 174-188). New York: Cambridge University Press. 382. Simonton, D. K. (2010g, Fall). Introducing our president-elect for Division 1: Dean Keith Simonton. The General Psychologist, 45 (2), 49. 385. Simonton, D. K. (2010j). Personality and leadership. In R. A. Couto (Ed. ), Political and civic leadership (Vol. 2, pp. 631-639). Thousand Oaks, CA: Sage Publications. 387. Simonton, D. K. (2010l). So you want to become a creative genius? You must be crazy! In D. Cropley, J. Kaufmann, A. Cropley, & M. Runco (Eds. ), The dark side of creativity (pp. 218-234). New York: Cambridge University Press. 393. Simonton, D. K. (2011b). Big-C creativity in the Big City: Definitions, speculations, and complications. In D. E. Andersson, Å. E. Andersson, & C. Mellander (Eds. ), Handbook of creative cities (pp. 72-84). Cheltenham Glos, UK: Edward Elgar. 401. Simonton, D. K. (2011j, Fall). General psychology’s wonderful new benefactor. The General Psychologist, 46 (2), 17. 405. Simonton, D. K. (2011n). Positive psychology in historical and philosophical perspective: Predicting its future from the discipline’s past. In K. Sheldon, T. Kashdan, & M. Steger (Eds. ), Designing the future of positive psychology: Taking stock and moving forward (pp. 447-454). New York: Oxford University Press. 411. Simonton, D. K., & Flora, C. (2011, Winter). Spark of genius [Introduction, Genius Special Issue]. Discover Magazine, 2-3. 414. Russo, N. F., & Simonton, D. K. (2012). Looking back and looking forward: The Society for General Psychology highlights from 2011. The General Psychologist, 47 (1), 4-9. 425. Simonton, D. K. (2012k). One creator’s meat is another creator’s poison: Field and domain restrictions on individual creativity. In D. Ambrose & R. J. Sternberg (Eds. ), How dogmatic beliefs harm creativity and higher-level thinking (pp. 125-134). New York: Routledge. 426. Simonton, D. K. (2012l). The Orlando program: The psychology of science and psychology as science. The General Psychologist, 47 (1), 2-3. 431. Simonton, D. K. (2012q, November/December). The science of genius. Scientific American Mind, 23 (5), 34-41. 432. Simonton, D. K. (2012r). Scientific creativity as blind variation: Explicit and implicit procedures, mechanisms, and processes. In R. Proctor & E. J. Capaldi (Eds. ), Psychology of science: Implicit and explicit processes (pp. 363-388). New York: Oxford University Press. 438. Simonton, D. K. (2013b). Age and creative productivity. In E. G. Carayannis (Editor-in-chief), Encyclopedia of creativity, invention, innovation, and entrepreneurship (pp. 40-44). New York: Springer. 440. Simonton, D. K. (2013d). BVSR theory of human creativity. In E. H. Kessler (Ed. ), Encyclopedia of management theory (Vol. 1, pp. 102-103). Thousand Oaks, CA: Sage Publications. 448. Simonton, D. K. (2013l). The evolution of the music-emotion relation. Physics of Life Reviews, 10, 277-278. 449. Simonton, D. K. (2013m). The genetics of giftedness: What does it mean to have creative talent? In K. H. Kim, J. C. Kaufman, J. Baer, & B. Sriramen (Eds. ), Creatively gifted students are not like other gifted students: Research, theory, and practice (pp. 167-179). Rotterdam: Sense Publishers. 452. Simonton, D. K. (2013p). Scientific creativity as combinatorial process. In E. G. Carayannis (Editor-in-chief), Encyclopedia of creativity, invention, innovation, and entrepreneurship (pp. 1592-1595). New York: Springer. 453. Simonton, D. K (2013q). What is a creative idea? Little-c versus Big-C creativity. In K. Thomas & J. Chan (Eds. ), Handbook of research on creativity (pp. 69-83). Cheltenham, UK, and Northampton, USA: Edward Elgar Publishing. 458. Kaufman, J. C., & Simonton, D. K. (Eds.). (2014a). The social science of cinema. New York: Oxford University Press. 459. Kaufman, J. C., & Simonton, D. K. (2014b). The social science of cinema: Fade in. In J. C. Kaufman & D. K. Simonton (Eds. ), The social science of cinema (p. x). New York: Oxford University Press. 461. Robinson, A., & Simonton, D. K. (2014). Catharine Morris Cox Miles and the lives of others (1890-1984). In A. Robinson & J. L. Jolly (Eds. ), A century of contributions to gifted education: Illuminating lives (pp. 101-114). London: Routledge. 468. Simonton, D. K. (2014g). Genius. In B. Thompson & J. G. Golson (Eds. ), Music in the social and behavioral sciences: An encyclopedia (Vol. 1, pp. 506-509. Thousand Oaks, CA: Sage Publications. 469. Simonton, D. K. (2014h). Hierarchies of creative domains: Disciplinary constraints on blind-variation and selective-retention. In E. S. Paul & S. B. Kaufman (Eds. ), The philosophy of creativity: New essays (pp. 247-261). New York: Oxford University Press. 473. Simonton, D. K. (2014l). The mad (creative) genius: What do we know after a century of historiometric research? In J. C. Kaufman (Ed. ), Creativity and mental illness (pp. 25-41). New York: Cambridge University Press. 476. Simonton, D. K. (2014o). The personal characteristics of political leaders: Quantitative multiple-case assessments. In G. Goethals, S. Allison, R. Kramer, & D. Messick (Eds. ), Conceptions of leadership: Enduring ideas and emerging insights (pp. 53-69). Basingstoke, UK: Palgrave Macmillan. 477. Simonton, D. K. (2014p). Preface. In D. K. Simonton (Ed. ), The Wiley handbook of genius (pp. xvii-xxi). Oxford: Wiley. 485. Simonton, D. K. (2015c). Defining animal creativity: Little-c, often; Big-C, sometimes. In A. B. Kaufman & J. C. Kaufman (Eds.). Animal creativity and innovation (pp. 390-393). San Diego, CA: Academic Press. 506. Simonton, D. K. (2016i). Intelligence, inheritance, motivation, and expertise. [Review of the books Grit: The power of passion and perseverance, A. Duckworth, and Peak: Secrets from the new science of expertise, A. Ericsson & R. Pool]. Intelligence, 58, 80-81. 516. Simonton, D. K. (2017b). Creative genius and psychopathology: Creativity as positive and negative personality. In G. J. Feist, R. Reimer-Palmon, & J. C. Kaufman (Eds. ), Cambridge handbook of creativity and personality research (pp. 235-250). New York: Cambridge University Press. 518. Simonton, D. K. (2017d). Creative productivity across the lifespan. In J. A. Plucker (Ed. ), Creativity & innovation: Theory, research, and practice (pp. 119-132). Waco, TX: Prufrock Press. 520. Simonton, D. K. (2017f). Creativity in psychology: Finding its niche in the sciences. In J. C. Kaufman, V. P. Glăveanu, & J. Baer (Eds. ), Cambridge handbook of creativity across different domains (pp. 247-260). New York: Cambridge University Press. 521. Simonton, D. K. (2017g). Does talent exist? Yes! In J. Baker, S. Cobley, J. Schorer & N. Wattie (Eds. ), Routledge handbook of talent identification and development in sport (pp. 11-18). London: Routledge. 522. Simonton, D. K. (2017h). Domain-general creativity: On producing original, useful, and surprising combinations. In J. C. Kaufman, V. P. Glăveanu, & J. Baer (Eds. ), Cambridge handbook of creativity across different domains (pp. 41-60). New York: Cambridge University Press. 524. Simonton, D. K. (2017j). From giftedness to eminence: Developmental landmarks across the life span. In S. I. Pfeiffer, E. Shaunessy-Dedrick, & M. Foley-Nicpon (Eds. ), APA handbook of giftedness and talent (pp. 273-285). Washington DC: American Psychological Association. 526. Simonton, D. K. (2017l). The genetic side of giftedness: A nature-nurture definition and fourfold talent typology. In J. A. Plucker, A. N. Rinn, & M. C. Makel (Eds. ), Giftedness: Reflecting theory in practice. Waco, TX: Prufrock Press. 533. Simonton, D. K. (2018d). Creative ideas and the creative process: Good news and bad news for the neuroscience of creativity. In R. E. Jung & O. Vartanian (Eds. ), The Cambridge handbook of the neuroscience of creativity (pp. 9-18). New York: Cambridge University Press. 534. Simonton, D. K. (2018e). Creativity and expertise: Creators are not equivalent to domain-specific experts. In D. Z. Hambrick, G. Campitelli & B. Macnamara (Eds. ), The science of expertise: Behavioral, neural, and genetic approaches to complex skill (pp. 328-346). New York: Routledge. 535. Simonton, D. K. (2018f). Cultural-historiometric studies of creativity. In A. K.-Y. Leung, L. Y-Y. Kwan, & S. Liou (Eds. ), Handbook of culture and creativity: Basic processes and applied innovations (pp. 61-82). New York: Oxford University Press. 537. Simonton, D. K. (2018h). The genius checklist: Nine paradoxical tips on how you can become a creative genius! Cambridge, MA: MIT Press. 539. Simonton, D. K. (2018j). Hard science, soft science, and pseudoscience: Implications of research on the hierarchy of the sciences. In A. B. Kaufman & J. C. Kaufman (Eds. ), Pseudoscience: The conspiracy against science (pp. 77-99). Cambridge, MA: MIT Press. 540. Simonton, D. K. (2018k). Historiometric methods. In K. A. Ericsson, R. R. Hoffman, A. Kozbelt, & A. M. Williams (Eds. ), The Cambridge handbook of expertise and expert performance (2nd ed., pp. 310-327). New York: Cambridge University Press. 544. Simonton, D. K. (2019a). Creativity and genius. In B. Wallace, D. Sisk, & J. Senior (Eds. ), The SAGE handbook of gifted education (pp. 70-82). Thousand Oaks, CA: SAGE Publications. 546. Simonton, D. K. (2019c). Gatekeeper interview: Robert J. Sternberg, psychological science. In P. Olszewski-Kubilius, R. Subotnik, & F. Worrell (Eds. ), The psychology of high performance: Developing human potential into domain-specific talent (pp. 219-224). Washington, DC: American Psychological Association. 547. Simonton, D. K. (2019d). 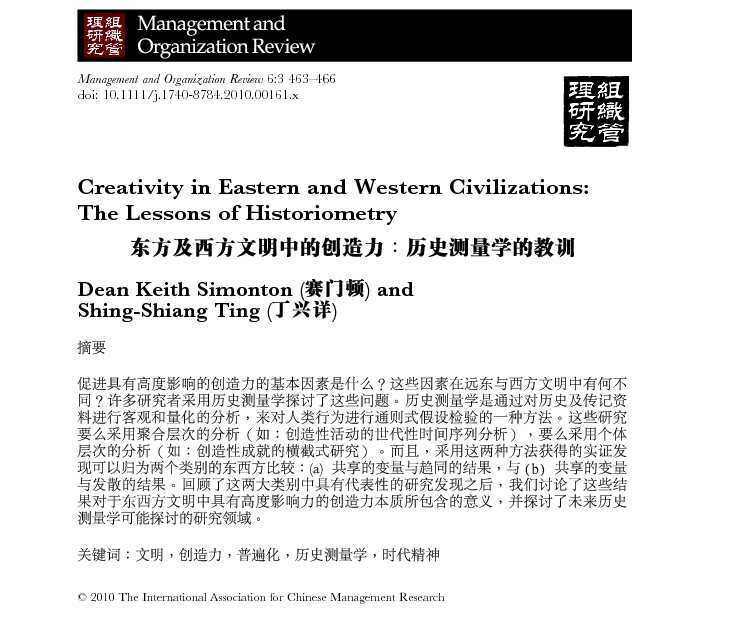 The sociocultural context of exceptional creativity: Historiometric methods. In I. Lebuda & V. P. Glăveanu (Eds. ), Palgrave handbook of social creativity research (pp. 13-25). London: Palgrave Macmillan. 548. Simonton, D. K. (2019e). The sociocultural context of exceptional creativity: Historiometric studies. In I. Lebuda & V. P. Glăveanu (Eds. ), Palgrave handbook of social creativity research (pp. 177-189). London: Palgrave Macmillan.